Until a year ago, Dubai was the dream destination of fresh graduates from Lebanon looking for good work and good money. Today, young Lebanese are entering the workforce with trepidation, knowing they face a job market with few good opportunities in the Gulf and even fewer in Lebanon. "There are no more places for fresh graduates. We're turning and turning, and we don't know where to go," says Jenny Zailah, an economics student in her senior year at the American University of Beirut (AUB). She says she expects to stay in Lebanon upon completion of her studies, and has already started looking for work in anticipation of a tough job market. 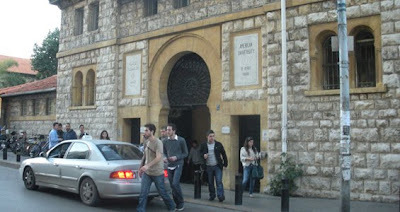 Khalil Dagher, a senior year economics student at the Lebanese American University (LAU), agrees. "Since the crisis is global, they have nowhere to go," he says. With a masters degree planned for next year, Dagher has at least another year to look for work. But he says that if he gets an attractive job offer during this time, he would probably be tempted to take it. "Sometimes you have to make tough choices." For decades, many in Lebanon have complained that the country loses some of its most skilled workforce to emigration. Now, with tens of thousands of skilled workers having returned from the Gulf and elsewhere, and with possibly even more soon-to-be graduates planning on staying put, Lebanon is facing the unusual problem of a "reverse brain-drain". It is unclear exactly how many Lebanese have returned home over the past year, but employers report an increase in job applications, real estate agents say that more homes are being bought by Lebanese nationals than in previous years and Lebanese banks are experiencing record-high deposits. "I'm receiving a lot of CVs from Lebanese coming back from the Gulf, from people who have either been laid off or whose salaries have been reduced," says Karim Makarem, a managing partner at Ramco, a Beirut-based real estate consulting company. "Unfortunately, their salary expectations are too high." Indeed, before the financial crisis, a starting salary in the Gulf was sometimes five times as much as one in Lebanon. Over the past year, as Lebanese have left the Gulf, they have taken their money with them and invested it at home. Bank deposits show that 2008 capital inflows were at a record high compared to previous years, reaching $16.506bn and increasing by 29.2 percent year-on-year. "Everyone thinks the money is coming from Lebanon's huge diaspora community," says Eric Mottu, an International Monetary Fund (IMF) representative in Lebanon. "A lot of money is being diverted from the Gulf and Europe to Beirut, because the financial sectors there seemed risky, and the system here seemed safer." But even with a record amount of capital flowing into Lebanon, Mottu believes job seekers here will have a difficult time finding work that matches their skills. "The market here is very segmented, and there are a lot of family-owned businesses. It's difficult to get work in higher managerial jobs if you're not well-connected," he notes. "The Gulf was attractive because there weren't barriers to do with religion or sect. That's one difficulty people are facing here." Mottu suggests that the government use the bank deposits to borrow money and spend money on infrastructure projects to stimulate the economy, although he admits that could be a problem with Lebanon trying to tackle the massive national debt it has incurred over the past two decades during its post-war reconstruction. In fact, the government says it has already come up with a good plan to meet Lebanon's growing workforce - something that apparently can not come soon enough. "We're seeing more [Lebanese expatriates] inquire about jobs in Lebanon," says Saad Andary, the vice governor of the Central Bank (Banque du Liban). "The impression we get from these people is that things are going to get worse - not better." Marwan Faour, who was laid off from his job in Dubai last year and who has just completed an MBA at the University of Grenoble, says he plans on returning to Lebanon, but acknowledges that he has no illusions about easily finding a job in his home country. "I am a bit worried about finding a job, especially because a lot of expatriates are already there trying to find jobs after they've come back from the Gulf," he says. "Another reason might be the 'favouritism,' which is widely implemented in the selection criteria." Still, he says, "this is my only chance to go back there," referring to Lebanon's improved security situation and growing economy.